Whether or not it has anything to do with a certain hit TV show is debatable but more and more Australians are becoming "His Master's Chef" and cooking not only for their families, but also for their dogs. Cooks who see their pets as a member of their family are dishing up noodles for poodles, rissoles for rotties and (German) shepherd's pie. 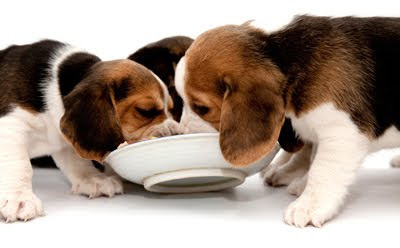 According to Dr Mark Perissinotto, chief vet with vetshopaustralia.com.au, a growing number of dog owners are turning their noses up at manufactured pet food in favour of home-cooked meals for their four-legged friends. "For a lot of people, a good quality commercial quality pet food is a good idea, however many people are transferring a lot of humanisation on their pets which are becoming a real part of the family," he said. "As pet owners we're finding that when we cook for ourselves we can also cook for our pets as well. "The beauty of cooking for our pets is we know what they're getting and there are diets which are easily available that are balanced and can provide all the proper nutrients and requirements they need. "People want to know their pets are getting more than just ground up leftovers like animal hoofs and offal from the abattoir in their pet food." Dr Perissinotto said it could also make the household budget go further. The vet's advice is to cook for your pet with the same care as you would for a toddler, remembering dog palates are not nearly as sophisticated as human ones. "A little bit of seasoning with salt is fine but there are things which are strictly off-limits like cooked onions, raisins, macadamia nuts, chocolate, avocado, alcohol those sort of things," he said. "In the wild a wolf is not just carnivorous, they'll eat everything they kill from the gut contents to the bones, even the hair and the hide so you do have to include things like bones which are also very good for keeping their teeth clean, in their diet. "Wolves also eat insects, dig up wild vegetables and chew on grass, and a lot of dogs love things like raw apple and raw carrot shredded into their meals." If you have any favourite recipes that you cook for your pets we would love to see them! Just send them to info@vetshopaustralia.com.au. Click here for more information from Dr Mark about cooking for your pets. Click here to read the full article at Ninemsn.